My mom loves to tell a story about how "detail oriented" I was as a small child. I think I was about six years old and was apparently creating some sort of improvised 3D construction paper house using a pen, scissors, and scotch tape. She fondly remembers that I wanted the house to be brick, so I grabbed some red construction paper for the walls and began free hand drawing every little line for the mortar. I guess I spent hours drawing each little line, and if I got something wrong, I'd start over on a new sheet of paper. Little did I know, this was an early example of the tone that would be set for so many projects throughout my life. 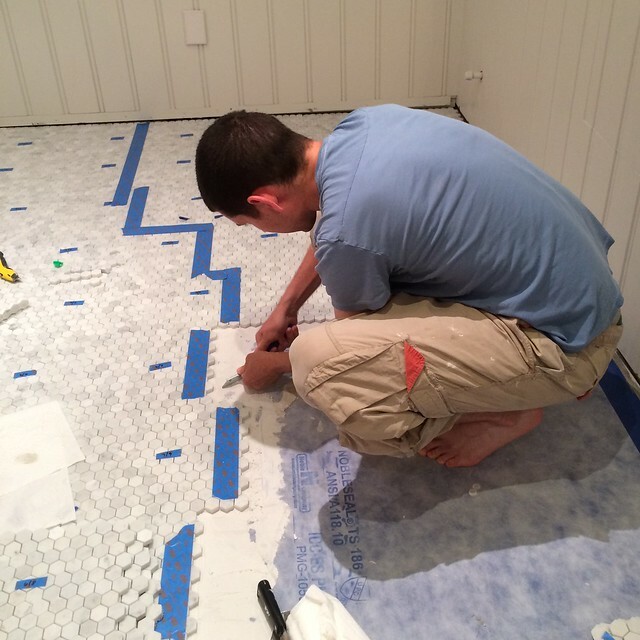 Like the construction paper house, the concept of tiling with a small mosaic pattern in a large room all begins so simply. The desire is obviously to have a beautiful room where the floor is covered by tens of thousands of tiny little pieces of naturally occurring stone that have been chipped off a much larger stone and sculpted by machines into tiny semi-consistent shapes. What could go wrong? The answer is even simpler than the perceived goal. A lot can go wrong! 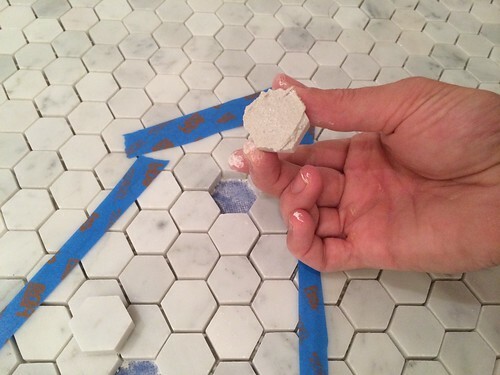 Mosaic tile and being a perfectionist in no way go together like peas and carrots. This is a difficult lesson we've learned during each of our tiling processes, and one that has several stages of tiling grief before reaching tiling acceptance. We love the tile, yes, but getting that floor in place took every fiber of my being and I still see problems that no one else sees. Evidence item number two...our vestibule. Teeny tiny as far as area, but a giant pain to lay since nearly even single sheet needed to be cut in some way. After our last master bathroom update we had reached the 95% mark on laying our tile. But that 95% was more about volume than actual completion of work. The idea in laying tile like this is to get the majority out of the way and save the hard stuff for last. Come to think of it, tiling ends up being treated the same way a lot of people treat most things in life. Empty the bottom dishwasher rack first because the top is a pain. Wash the whites and towels first because folding the colors is a pain. Rip apart your whole house first...because putting it back together is a pain. You get my drift? Anyhow, we had laid the majority of the field tile and left the more difficult areas that required measuring, lots of cuts, and a fair amount of patience for the last few steps. Good plan! Until it came to doing all of the detail stuff. It's times like these where I wish we had a house elf of the Harry Potter variety that could assist with the tedious work. Our final steps in laying tile required cuts at the door threshold and inside the closet (the one with the awesome panelled walls). We actually made pretty short work of it since the walls in the closet will ultimately have small shoe molding to mask any variability in the cut. To be honest, I was dreading the door threshold. 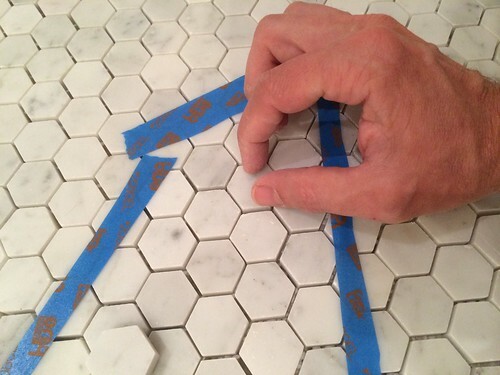 After we chose to lay the tile "on point" instead of "on side," there was the nagging voice in my head that kept saying, "Now you're going to have to make lots of cuts like all of those people on your blog said you will." To make matters worse, the wall is ever so slightly out of square to the lines of the tile and the rest of the room, so the threshold isn't a true 90 degrees to the pattern of the room. But when it comes to mosaic tile, this turns out to be not that big of a deal. I laid the tile in place and made pencil marks on the tile where it met the edge of the threshold. Using a straight edge I connected those lines and took the sheet down to the tile saw (which is in the basement, my legs got a workout on this project). I then slowly cut the sheet to give myself that slightly askew line the threshold needed. Any cuts that were too small to make on the sheet, like the tiny little triangle points, I made by cutting individual tiles. It wasn't terribly difficult, but it was a bit time consuming. But the end result? We have a nearly perfect threshold that should look pretty good once grouted. Now we just need the marble slab piece to fill in the transition. One would think that laying this final critical element of mosaic marble tile would mark the completion of this major step in our bathroom journey. Perhaps we could now move onto sealing the stone and then grouting. However, if one would think that we logically move from one thing to the next, completing each task and then tidily moving onto the next step in the process with no significant steps backwards...well, I'd say one does not know us well. No way, no how, could we leave well enough alone. After allowing our fully laid floor to cure for the prerequisite 24 hours, we began walking over the beautiful stone and discovering its glaring imperfections throughout. I know I may have said we are embracing the "consistent inconsistencies" of the stone, but this is so foreign to us that we were having a particularly difficult time letting some of the more egregious flaws fly. For example, do you see the glaringly horrible space that's too large running along several of the tiles that clearly shows the demarkation line separating two sheets in the following photo? It may be a little harder to see in the photo, but when we saw it in person we couldn't stand it. Look at the line three tiles south of the detached sheet. So what do you do in this situation? 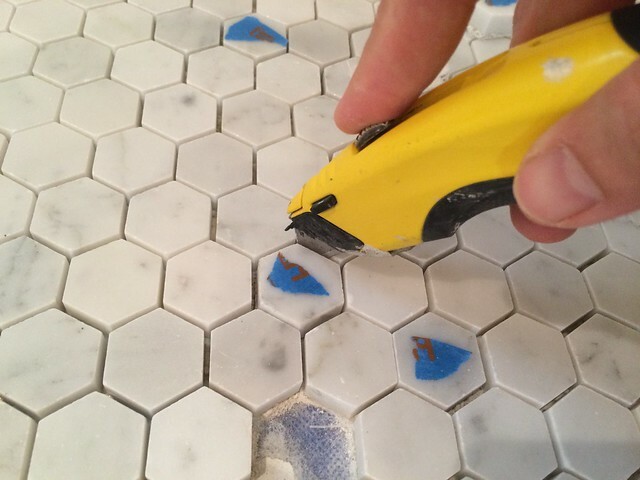 How do you resolve your tile laying mistakes, or even previously unseen issues in the tiles themselves, beyond the 24 hour dry time of the thinset? Well, you start by defining the tiles that are particularly offensive throughout the whole room. In our case we were looking for tiles spaced too far apart, tiles way too close together (especially those touching), tiles too tall or too low, significantly crooked tiles, and collections of tiles that were off from the pattern in too consistent of a manner. And once you find them all, you mark all of the problem tiles with tape. This tape marking scheme makes it much easier to identify and move on, rather than attempting to fix every tile you need to adjust. Once you've gone over the whole room and have all of your biggest issues identified, it's time to get to work. Since the thinset has already cured to some extent, you can't just pop tiles out without causing issues. This is especially true when the tiles are still adhered to the mats they were laid on. Chances are, if you pull up on one of the tiles in the mat, you'll end up ripping up far more than just the one or few problem tiles. In this case I grab my utility knife and begin tracing the perimeter of the tile to cut the mat and free the tile. IMPORTANT!!! Don't ever do this if your tile is laid on a waterproofing membrane of any sort in a shower or other area that must remain waterproof. There's a pretty great chance you'll perforate your membrane and ruin your whole DIY life. We didn't need to worry about this on our floor as our membrane is just there for isolation purposes, not waterproofing. So an incidental puncture wouldn't be catastrophic. 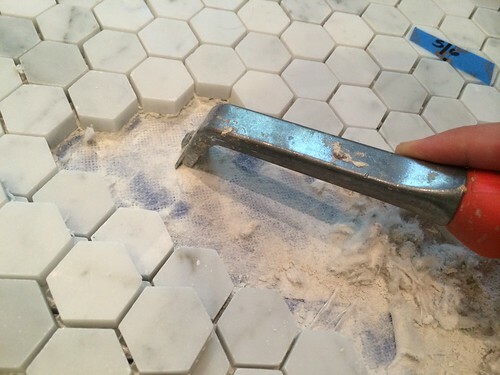 Once the tile's sheet is scored, use a pry bar, putty knife, or some other small edge you can use as a lever. I use our pry bar and really jam my thumb in behind it. 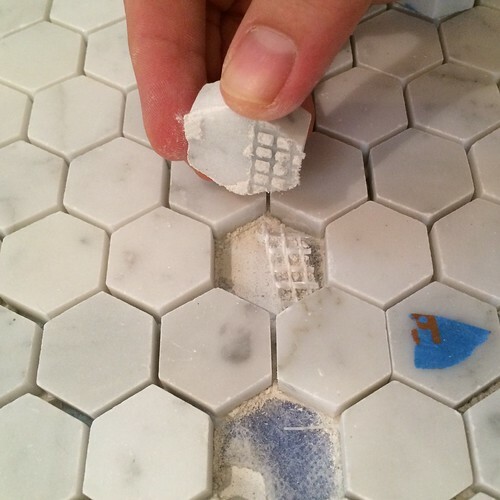 I find using my thumb in this way protects the surrounding tile from getting chipped edges. Applying gentle pressure to the stone you want to remove, you can usually pop it right out of its place. As a byproduct, you'll also get a pretty good sense of how well you did in getting the thinset coverage on the back of the tile. Then you just grab the loosened tile and pull it free. When the tile, or group of tiles, is free from it's location, set them aside. 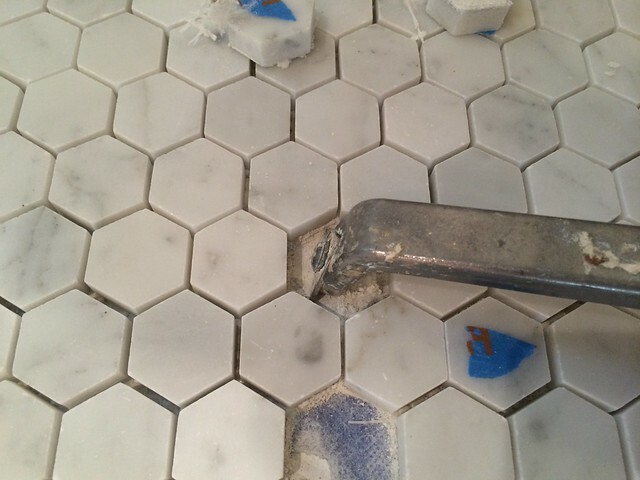 Since they have thinset all over them, it's usually easier to grab some tile from your leftovers to replace the removed tiles. Before we can replace the removed tiles, we need to clean out the old thinset, otherwise we'll almost certainly end up with new tiles that correct the spacing or orientation issues of the problem tile, but it will be far too high and always look out of place. And we all know, this is what we'll stare at while we're in the room, always wondering why we didn't fix it properly. I like to scrape out the old thinset using some of our paint stripping pull scraper tools. The scraping heads are small enough to get into the small spaces, and the edges ensure I'm getting right down to the membrane fleece. Again, if you're doing this in a waterproofed space, make sure you're exercising tremendous caution to be sure you don't puncture the membrane. This method works on single tile spaces or much larger area, so it's great no matter the issue. After all is said and done with the scraper we had a clean space that was ready for our adjusted tiles. Like I said, big or small. Depending on the tiles removed we had to either select single tiles that would fit the space, or a collection of multiple tiles we could lay in as a mat. 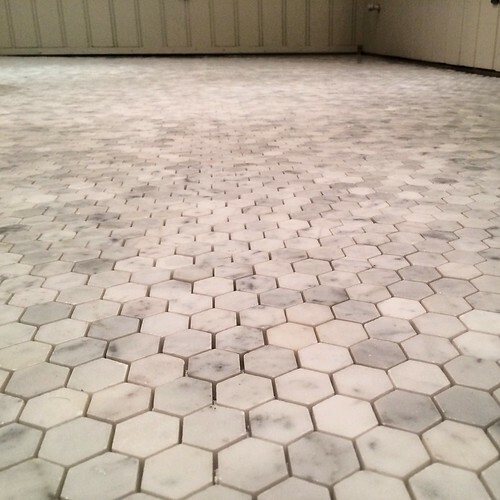 This process, due to the minor variances with each tile, required us to select the individual tiles and then lay them next to their intended location with a specific orientation. We couldn't just grab any tile and pop it in, it had to be a specific tile. You can see how I laid out the specific groups of tiles that would fill the space below the now vacant area. This is important whether it's one or 30 tiles. This is also where that "detail oriented" nature I learned I had as a kid really came into play. It's a trait that grossly expands the timeline of a project, making it border on the unbearable, but it produces some tremendously improved results. 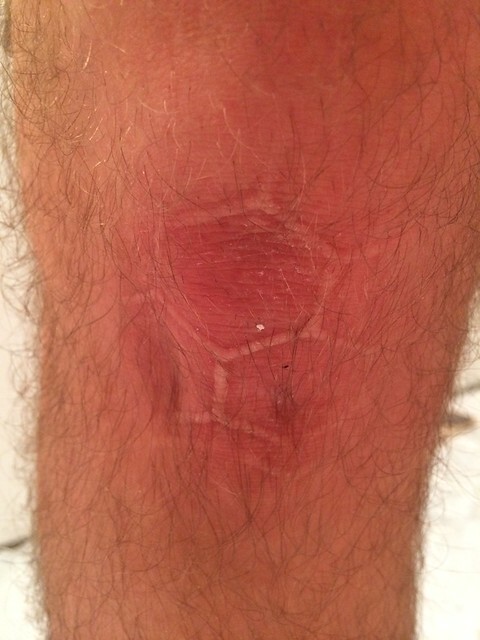 Incidentally, when working on hexagon tile without knee pads, it also leaves quite an impression...of sorts. When we were happy with the selection of replacement tiles it was time to proceed with a little batch of thinset mixing. Since we're just laying a small number of tiles, we really didn't need much thinset at all. Maybe a cup or two at most. After the the surface was clean of old thinset, and the tiles were specifically chosen for each area, putting the tile in place was actually the easiest part of the whole process. Using a technique aptly called "back buttering" it's simple. 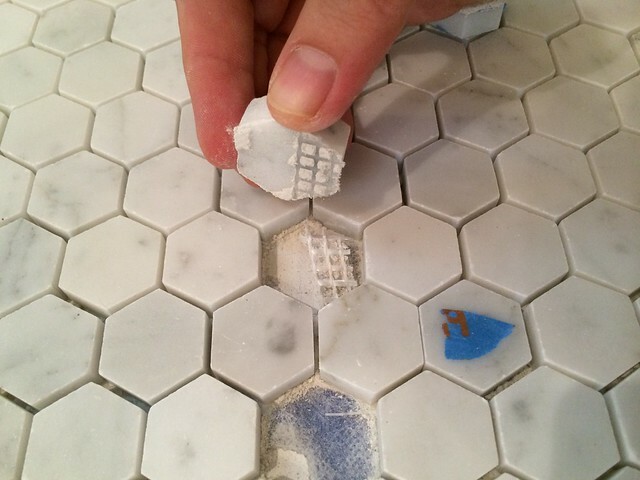 Just grab a bit of thinset and smear it on the back of the tile that's being placed. With small or single tiles, it's best to overfill the back just a bit to ensure good coverage, usually with a peak right in the middle. When it's placed, this little peak smooshes out to the edges and allows the tile to sit at exactly the right height. With larger mats of tiles I still like to apply the thinset and then scrape it off with my V-notch trowel. This ensures that there isn't too much thinset when I place the tiles, otherwise I might end up with some of the thinset coming up between the pattern. ...then to step back and admire the newly set tile. 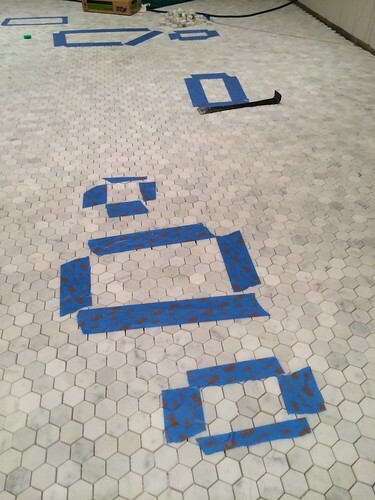 We always use a tape outline to either show the results of our tile crime scene efforts, or to ensure we don't step on any of our wet tile areas for another 24 hours. As you can see, we ended up pulling up and putting back down quite a few areas where we weren't happy with the initial layout. In reality, this is just the first of what turned out to be two go-rounds with this pull up and put down process. In total, we ended up making these adjustments to about a dozen different places in the bathroom. We pulled up strips of tiles where the line was too apparent, sections where there had been problems in the sheets, and many different area where two tiles were touching. And after all of those efforts, what happened? We. Keep. Finding. More. Problems. It's inevitable. 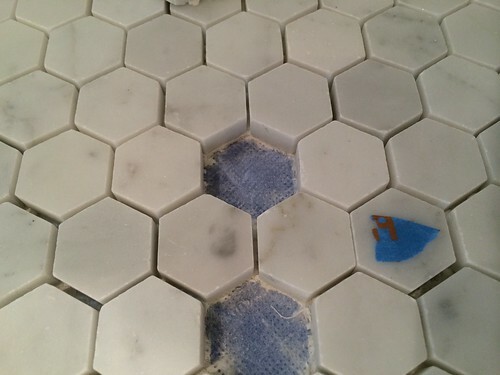 No matter how many things you fix in a tile job like this, you're going to find more problems. At a certain point it becomes Pandora's box, and the more you fix the more you find. The cycle goes on endlessly and we could spend a solid week doing nothing but fixing problems only to find more. So we decided that two rounds of fixes were enough for our room and we called our tile layout efforts complete. I'm sure after we finish grouting I'll find plenty of places that drive me crazy about the final floor, but I'll begrudgingly chalk it up to the character of an old house and using a stone mosaic floor. We're anxiously looking forward to the next step in this flooring phase, but we're mulling over other decisions. 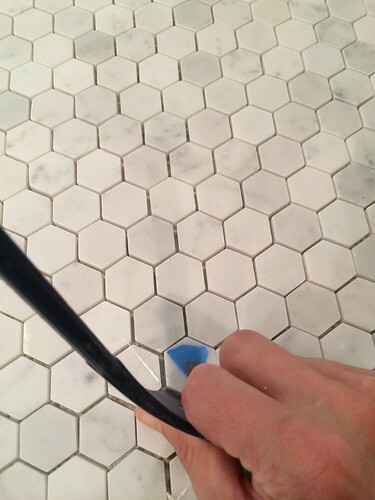 More specifically, what color grout to use. It's a major debate, I assure you. We'll share the whole process we're going through for that next week. But I'll tell you one thing for sure, I'm both dreading and excited to start that step. 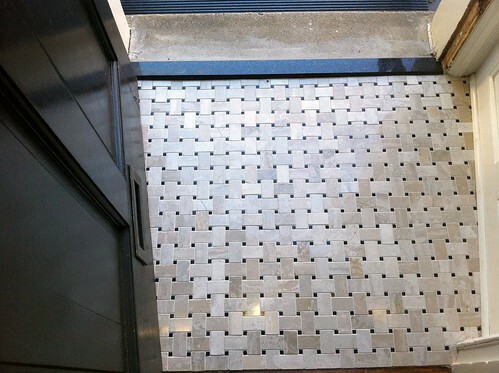 Do you have any experience laying mosaic tile on the floor and have any tips or tricks to share? Do you think we're going overboard with the corrections we're making? Or is it possible our exercise in futility will actually improve the floor enough that we won't just stare at all of the imperfections when, as our commenters all put it, we're sitting there on the toilet? Fingers crossed, we're on the positive side of that debate. Your guest bathroom is stunning! Oh my. I admire your dedication to perfection. I can tell you with 100% certainty what I would have done: "Ohh, I can see where the sheet of that tile meets the other. I'll just keep going with the project and hope that the grouting makes things less noticeable. Tra-la-la-de-dah." Thank you! 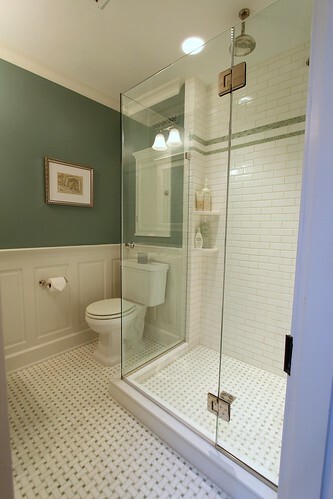 Having that guest bathroom is what's kept us sane on our master bathroom work. We have a very nice bathroom to use full time until we're done with our master. Sing it with me Alex and Wendy! "LET IT GO! LET IT GO! DON'T HOLD IT BACK ANYMOOOOOORE!" I have a 2 year old who loves Frozen. Can you tell? Every time I hear that song I think of all of my friends with kids who have had it on repeat for months on end. But I do think I'll need to embrace the lyrics as it pertains to this project. I like being the good kind of nuts. 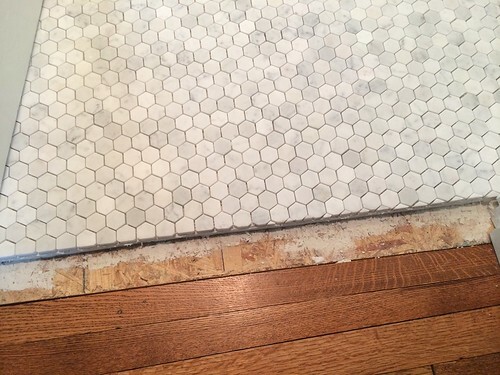 You have successfully talked me 100% out of doing small hex tile in my bathroom, and in fact I fear I now have anxiety solely from your bathroom tile project. I may be breathing into a paper bag right now to stop myself from hyperventilating. Come on! Misery loves company, and I know you guys can do it! 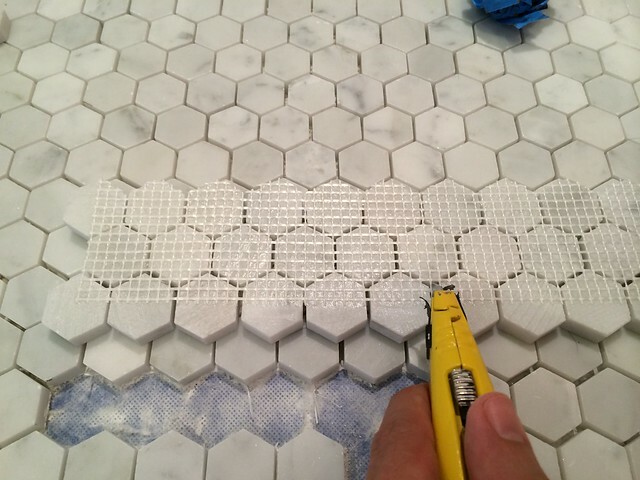 Your tile job looks great. 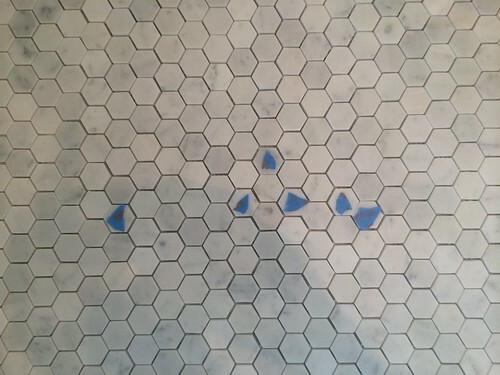 These are bad tile jobs. I've seen a few rough ones in my day, and every time I think about an imperfect tile or two in our layout, I just jump back to those mental points of reference. It could be so much worse. Is it overboard? Yes..., and no. Now's the time to do the fixes, and you can choose to do as many as you want. Hell, if you wanted, you could tear half the floor up, but I'm kind of the same way. I am more of an "eyeballer" when it comes to tiles. I hate using those plastic spacers, and for my bathroom (as an example) the slate tiles weren't 100% square to each other anyways. One of the problems with tiny hex tiles like these is they're not 100% factory perfect. They're close, but they can easily end up misaligned. I would almost be tempted to separate the tiles from the mesh and increase the spacing slightly, but THAT would be insane. Then again, I'd have the opportunity to individually tweak each tile. Too much work though for a room this size. 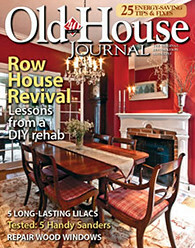 I've said this before, and I'll repeat it: with old houses, I aim for 95% on most projects. There will be flaws and part of the charm of old houses are the flaws. 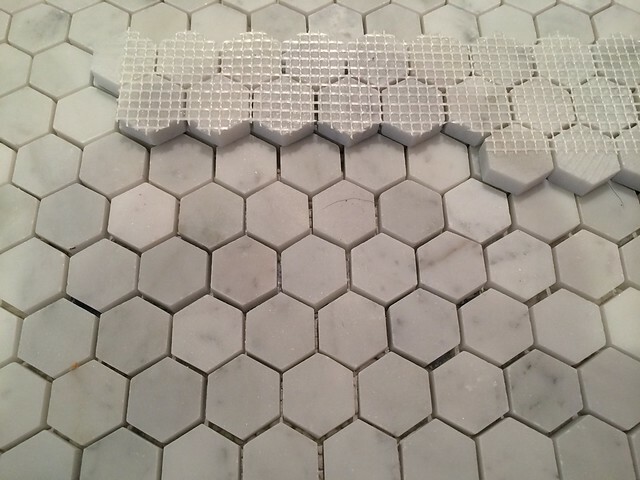 I kept thinking "how long would it take to lay each tile individually, and would it be crazy to do that? I would be tempted in a smaller room. I do like the 95% rule on old houses, and it does make it feel more authentic. Even when we walk through amazing museum properties, I can still find issues when I look close enough, so I remind myself, nobody is perfect. The house elf was named Dobby. I've been waiting for him to show up at my house for years! Wendy sometimes refers to me as Dobby, primarily when I'm doing laundry. Wow! I applaud your persistence! The tile looks great, although as a trying-to-be reformed perfectionist, I realize how easy it is to only focus on the flaws. 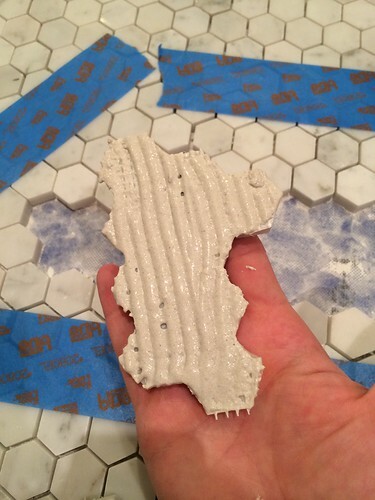 Two things I've learned with tile: The discrepancies always look worse before the grout is finished, and if you choose a mid-tone grout color that minimizes the contrast with the tile, they're even less noticeable. Yes on all of your points, but as you probably know, it's not easy to keep perspective when your face is right in the problems. I didn't bother to fix any of the problems with my hex tiles. 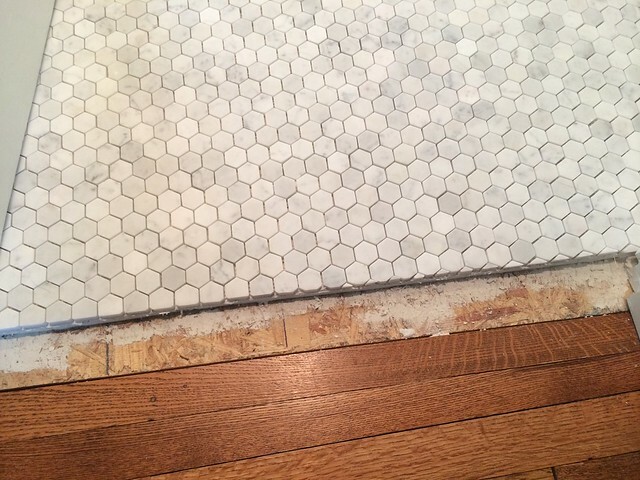 There is one crooked tile and one part where the last couple of sheets that were laid were too close together. (It was quite tricky choreographing just how to lay the tile in such a small space anyhow.) It's character, I tell ya! I have reproduction unglazed black and white 1" porcelain tiles from American Restoration Tile. On the advice of Bryan Byrd from ART, I went with a medium gray grout and also used a grout release on the tiles. Cleanup after grouting was a snap. I also adhered leftover tiles to a couple cement board scraps and tried a few different premix grouts to hone in on the right color. The room was so small I didn't even use up an entire bucket of the premix, saved me the mixing step. If you saw our latest post, I did just as you outlined with the sample board. It's such an important thing to do because it's so hard to visualize how it will look when all laid out without a larger example. I am nowhere near as detail-oriented as you are, but I noticed the flaws in our hex tiles in our home in CA. I started in on perfecting one section, and quickly decided I didn't care. LOL By the time I added grout, the issues were very unnoticable. The grout confused my eyes or something. For the grout color, I would say don't go with white. A light grey or dark grey (something that relates to the veining in the stone). Thanks, Susan. This is more or less exactly what we did. I did want much darker, but something with too much contract would have just been too much. The color we chose matches some of our darker tiles in the room. We used epoxy in our guest bath but we're going to go with simple unsanded cement with this one. We'll just be super diligent with applying sealer. Oh, you poor O.C.D. baby. I am in awe of the beautiful work you have done and your attention to detail is a good quality when remodling. You seem to be in "control" of your desire for perfection, though that statement seems to be a conflict of terms. You must have the patience of Job. Wow! I think Steve is correct to advise you to, Let it go!" Barely in control...for now...for the most part. Sometimes it gets the better of me, and Wendy says I get into a "spiral." She does her best to snap me out of it, but I could work on the same small detail on a project for weeks or months rather than just moving on. Did you ever post about which tiles you chose (company/style/size etc) and your deliberation process? Sorry if I missed it! I could only find your post about the samples and that you would post the details when ordered. I am interested in a similar look for our bathroom remodel. Thanks! I've mentioned it a few times in comments, and only one small mention in a post. We got 1.25" Carrara hex from Oracle Stone & Tile. I'm not positive it's actually Carrara (from Carrara) or simple a white/gray marble. The cost/sqft was about $9.30 after a 10% off coupon they sent with our sample order. Their website stock and selection doesn't match what's actually offered always, so it's best to call them. Hi! I know this thread is years old, but I was happy to find it as we are dealing with a similar issue right now. 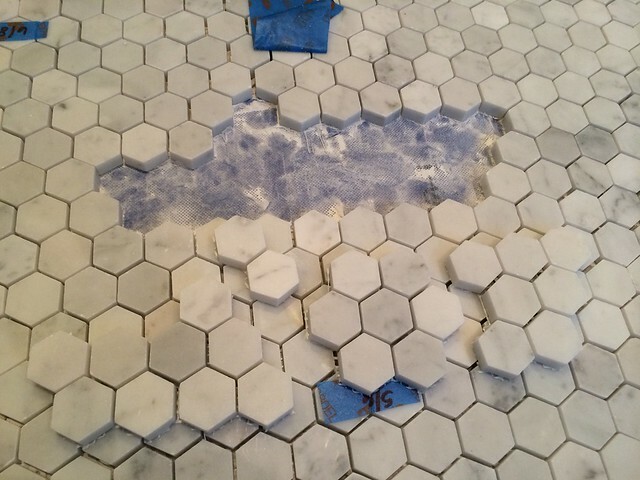 Only our 1” hex tiles were thinset to the floor by a subpar contractor and now we are trying to fix it ourselves before it’s grouted. Had you used this method days after the thinset had cured? Or only while the thinset was still soft? Hoping we’ll be able to use a razor knife and loosen stone that has been mortared for a week. Hoping you might see this comment. Ugh! What a nightmare. Your floor looks beautiful, lovely job. Hi Bonnie! You should be able to do it well after the thinset has dried, but you need to scrape off what's there so you can fill in the new stuff. You should be able to work the stone loose, then I liked using a small triangle pull scraper (for paint stripping) to get the thinset up. Just make sure you're not damaging any waterproof membranes if you need to do it on the floor of the shower. For us we did this quite some time after they were set, maybe even weeks.